For the sharp-eyed ones who've noticed by now - nope, that's not an art mistake. Meanwhile- fix the drinks, pop the popcorn, wire up the prisoner - we're going on a little tale. We're going on a tale? You mean you haven't even started yet?! RT - There are tales, tales within tales, and tales wagged by shaggy dogs. No reason not to expect all three in the course of events around here. 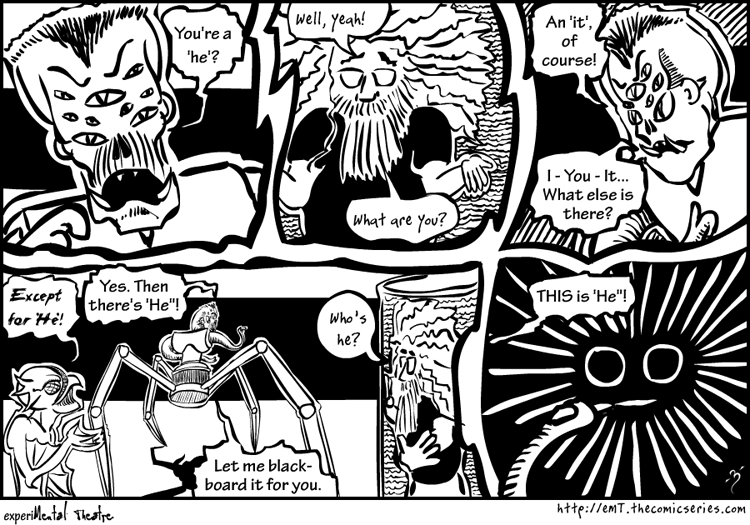 And EVERYBODY - do yourselves a favor and vote for eMT between now and Monday's strip. The incentive is extra-special: The great MO shows us her version of experiMental Theatre! What about "him" and the much preferable "her" and "she"!